We are now located in Auburn, Alabama. WE DO NOT OFFER HOUSE CALLS. WE WORK DIRECTLY WITH YOUR REGULAR VETERINARIAN. For the Veterinarian, Mobile Veterinary Ultrasound, LLC travels to Veterinary Hospitals within 45 minutes of Auburn, Alabama to perform ultrasounds on small animals and exotic pets. Many of our clients have their own ultrasound machines, but are unable to perform certain types of ultrasounds because of lack of time and training, or due to the age of their equipment. We bring our own state of the art Ultrasound Equipment to your practice. With our machines, we are able to provide quality images, as well as both Color and Spectral Doppler. For more information on how ultrasound can improve diagnostic efficiency in your hospital, please visit: www.sonopath.com. Please note our list of references under the "About Us" page. For the pet owner, ultrasound provides a non-invasive and pain free way to diagnose many problems with your beloved pet. Your veterinarian may suggest an ultrasound when blood work, x-rays, and other tests do not give a definitive answer for your pet. Just a few of the diseases and conditions we can help to diagnose include age-related heart disease, congenital heart disease, thoracic tumors, abdominal tumors, gastrointestinal disease, liver disease, gall bladder disease, kidney disease, adrenal gland disease, stones in the urinary bladder and kidneys, and pregnancy. Our prices will be much lower than a referral hospital, and we will examine your pet at your regular vet, where both of you will be more comfortable. 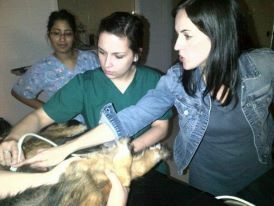 Mobile Veterinary Ultrasound, LLC is staffed by a husband and wife team of veterinarians, Drs. Lindsey and R. McKenzie Daniel, who have over 200 combined hours of specialized ultrasound training. The Drs. Daniel have also worked as consultants for Sound-Eklin in New Jersey and New York. We offer discounted rates for Rescue Organizations. We are privileged to work with Fur Kids, Small Dog Rescue, Basset Hound Rescue, Georgia English Bulldog Rescue, PAWS Atlanta, Alcovy Pet Rescue, Angels Among Us, and the Athens Area Humane Society.